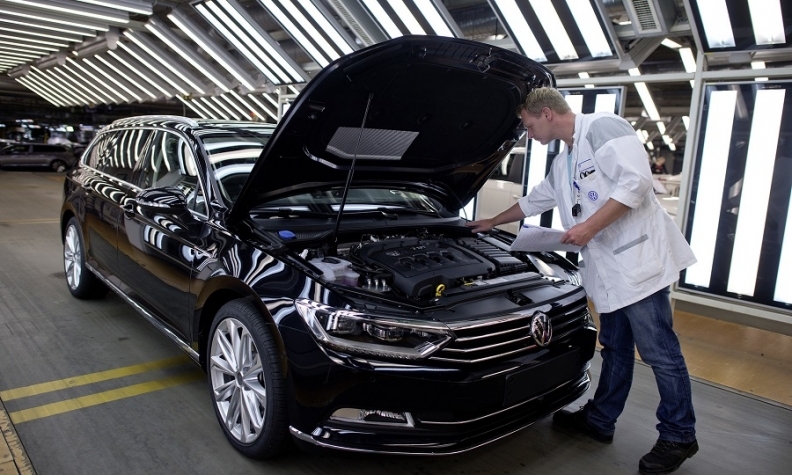 A Passat wagon is checked at VW's Emden plant. Production may be transferred to a Skoda factory. Production of the Passat would shift to Skoda’s Kvasiny factory, where the related Skoda Superb is built, Handelsblatt reported, citing company sources. VW Group is looking for a site for a third Skoda plant in Europe because the brand's two Czech plants are already running at close to capacity. Bulgaria and Turkey are possible locations, Handelsblatt said. VW builds the Passat alongside the Arteon in Emden, Germany. Both are midsized models. Passat sales have been hit by a customer shift to SUVs and crossovers and a slump in sales of diesel cars. European sales of the Passat fell 5.6 percent to 127,325 in the first nine months, according to JATO Dynamics market researchers. Sales of the Arteon, a new addition to VW’s portfolio, were 17,751 in the same period, a year-on-year gain of 12,770 units. VW Group plans to convert its Emden and Hanover factories to build EVs, joining its Zwickau plant to create what the automaker said will be Europe's largest EV production network. VW said on Wednesday that production of the models currently built at Emden and Hanover will be transferred step-by step to other group plants. The automaker's supervisory board will decide on plant allocations on Friday, it said.